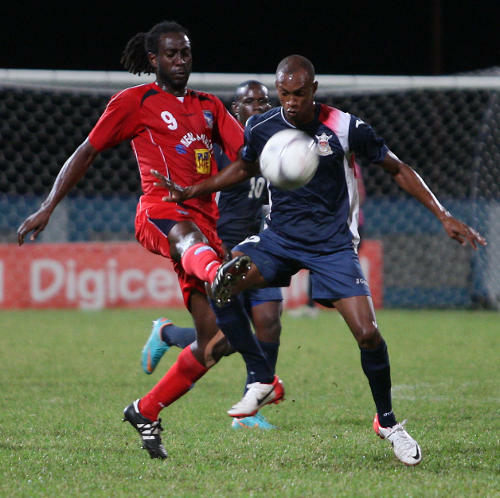 The 2012/13 Digicel Pro League football season is barely at the halfway mark this weekend. And yet there could be no questioning the right of the Defence Force team to hold the ultimate prize. Not anymore. 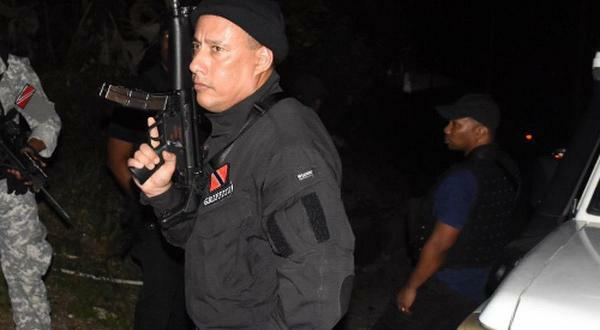 At the Ato Boldon Stadium in Couva last night, the army/coast guard combination sent shudders through the local top flight competition with a 5-1 demolition of Caribbean champions, Neal & Massy Caledonia AIA. Photo: Defence Force winger Jemel Sebro (right) holds off Neal & Massy Caledonia AIA midfielder Keyon Edwards last night in Couva. The score line might not have reflected the balance of possession but it was certainly a fair indication of the difference in either team’s offensive impact yesterday. The win sent Defence Force eight points clear of second placed Caledonia, although the latter has a game in hand. The statistics speak for themselves. In its last four games, Defence Force scored 19 goals and conceding just twice while it is 25 scored and four conceded if you tracked the soldiers’ last six matches. The most ominous bit is the way coach Ross Russell’s troops manhandled the League’s elite clubs. 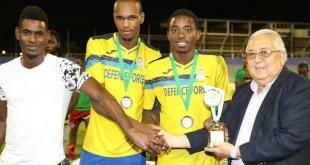 On 21 December 2012, Defence Force met DIRECTV W Connection in Port of Spain and spanked the defending champions by a similar 5-1 margin. Remarkably, Connection scored first against the soldiers. But Russell’s men are clearly not easily rattled. Connection was in action yesterday too as the “Savonetta Boys” enjoyed a tranquil outing against a St Ann’s Rangers outfit that is still reeling from the effects of the January transfer window. Only four Rangers players fielded yesterday—Devon Modeste, Jamal Jack, Cameron Roget and captain Mikhail Awai—were regular starters when the season launched last September. And coach Dean Pacheco never looked like engineering an upset. Trinidad and Tobago striker Hashim Arcia, who was pushed from midfield to upfront after Shahdon Winchester left for trial on Monday, opened the scoring with a simple tap in off a low, right side cross in the 11th minute. And another “Soca Warrior”, utility player Joevin Jones, doubled Connection’s lead with a precise 22-yard blast in the 43rd minute. Photo: DIRECTV W Connection midfielder Silvio Spann (centre) congratulates teammate Joevin Jones (right) while Kurt Frederick looks on. Jones was fielded just behind Connection’s three attackers yesterday and, although it was not a particularly testing fixture, he showed some of the crisp passing and movement that has made the 22-year-old one of Trinidad and Tobago’s most promising young players. It was just Jones’ second League item this season, which is an indication of Connection’s recent struggles. But at least the Savonetta Boys seem to be moving in the right direction. Caledonia coach Jerry Moe might not be sure as to where his squad is heading at the moment. Three-quarters of Caledonia’s starting line-up are seeking their fortune in Europe and the United States at the moment. 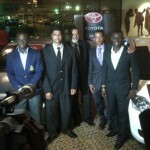 And coach and part owner Jamaal Shabazz vowed to distance himself from the club’s technical business since joining the national team’s technical staff while, in any case, he is also abroad. Moe, alone, must try to gel a new team in the middle of the season. It is hard to say how much of last night’s rout was down to Caledonia’s deficiencies and how much was testimony to Defence Force’s awesome firepower. The truth, as is often the case, lay in between. Caledonia opened the scoring after just eight minutes with the first real goal attempt of the match. Sheldon Holder cut in from the right and surprised Defence Force custodian Kevin Graham at his near post with a speculative left footer from just outside the box. Once ahead, Caledonia instinctively stepped back for a few seconds; perhaps to take a breather or maybe in an attempt at self-preservation. Within eight minutes, Defence Force was ahead and, before the interval, the soldiers were out of sight and already assured of a seventh successive League win. Photo: Defence Force winger Kevon Carter (left) is congratulated by teammate Devorn Jorsling as the soldiers stormed to a 5-1 win over Caledonia AIA. Whatever you do against the “Teteron Boys”, do not show fear and never stop competing for the ball. The likes of sharp shooter Devorn Jorsling thrive on even a flicker of uncertainty. True, there was a slice of good fortune as Defence Force equalised off a Kareem Joseph own goal in the 10th minute. But there was no one applying pressure on midfielder Curtis Gonzales as he sauntered forward and lofted a pass behind the Caledonia defence for Jerwyn Balthazar to chase. Joseph, Caledonia’s buccaneering right back, got there first but, facing his own goal, advertently beat his own goalkeeper with a looping header. If Moe was disappointed by the Army’s first item, he might have been livid about the second. Caledonia defender Colin Nelson felt he got the ball with a slide tackle on Jorsling but referee Neal Brizan thought differently and the former Caledonia employee nonchalantly converted the penalty in the 18th minute. 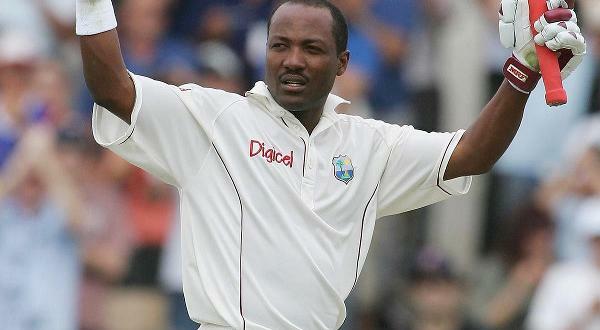 Thereafter, Caledonia’s rookies on each flank, Guyana international Vurlon Mills and former Trinidad and Tobago 2009 Under-20 World Cup player Qian Grosvenor, went missing and the rout was on. Defence Force left back Aklie Edwards strode into acres of space behind Mills to cross for Jorsling’s second in the 26th minute. It was his 10th League goal from eight outings and the best individual tally of this season so far. And Grosvenor failed to adequately protect Caledonia left back Aubrey David as Balthazar crossed for Kevon Carter to grab Defence Force’s fourth item in the 43rd minute. 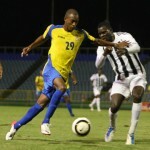 Photo: Caledonia AIA striker Trevin Caesar (right) battles with Defence Force winger Jemel Sebro for possession. Moe withdrew Grosvenor early in the second half as Caledonia switched to 4-3-3 but Mills’ shocking evening continued while the overlapping Joseph also created little as the Stallions lacked their usual winged menace. Striker Trevin Caesar did muster one decent effort off a through pass from substitute Akim Armstrong but Graham matched it with a flying save to his right in the 57th minute. Otherwise Caledonia, for all its possession, might have well been flinging pillows at the soldiers. 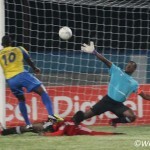 And erratic goalkeeper Glenroy Samuel added insult to injury in the 87th minute as he launched a clearance straight at Josimar Belgrave, who was 30 yards away, and then failed to keep out the Army substitute’s first post effort after he worked a one-two with Jorsling. It was a score summary to send chills throughout the country. To compound Moe’s problems, he has little time with his team on the training ground due to Caledonia’s involvement in the TTFF FA Trophy competition, which offers no prize money for the participating clubs. 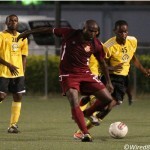 Caledonia travelled to Plymouth to eke out a 1-0 win over Stokely Vale in midweek while Defence Force rested. And the Stallions face North East Stars in the FA semi-final round on Wednesday before their next Pro League assignment on Saturday against T&TEC. The coming weeks might be the most testing of Moe’s career as Caledonia head coach. Defence Force, as evidenced yesterday, will have little sympathy. Defence Force (4-2-3-1/4-1-4-1): 1.Kevin Graham; 14.Cory Rivers (captain), 5.Devin Jordan, 20.Rodell Elcock, 21.Aklie Edwards; 3.Keston Williams (12.Josimar Belgrave 37), 8.Curtis Gonzales; 29.Jemel Sebro (17.Ross Russell Jr 66), 15.Jerwyn Balthazar (16.Kerry Joseph 78), 11.Kevon Carter; 10.Devorn Jorsling. Unused substitutes: 25.Sheldon Clarke, 4.Marvin Jones, 6.Michael Edwards, 18.Sean Narcis. 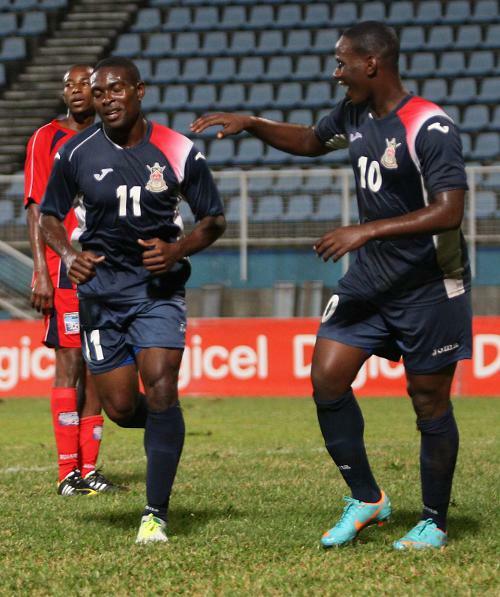 Caledonia (4-4-2/4-3-3): 33.Glenroy Samuel; 12.Kareem Joseph, 4.Colin Nelson, 20.Akeem Thomas (24.Shemol Trimmingham 69), 2.Aubrey David; 26.Vurlon Mills, 7.Stephan David (captain), 9.Keyon Edwards, 30.Qian Grosvenor (17.Akim Armstrong 56), 28.Sheldon Holder (14.Elvis Thomas 56), 6.Trevin Caesar. Unused substitutes: 1.Shem Louision, 18.Sherron Joseph, 27.Nathan Lewis, 22.Miguel Romeo.